North Bay Toyota makes presentation on their pledge. North Bay Toyota and group (North Bay Mitsubishi and Rona) are proud to present a cheque for $7,000 to the Nipissing Serenity Hospice as part of our ongoing commitment which will exceed $40,000. The hospice is getting ready to begin construction soon, and we are pleased to make this contribution to this important cause. 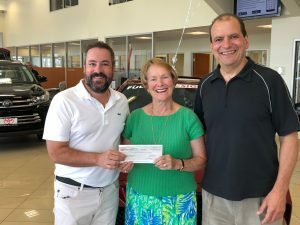 From left to right, Tim Falconi presents the cheque to Mathilde Bazinet (Chair) and Dave Mendicino (Fundraising Coordinator) for the Hospice.